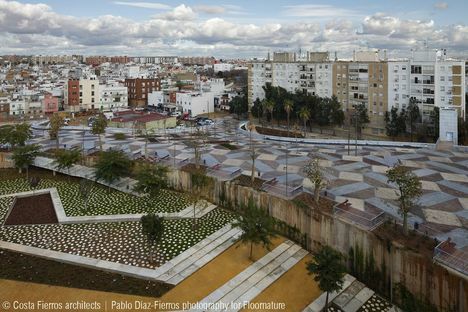 Following construction of Cocheras underground station in Seville, Agencia de Obra Pública de la Junta de Andalucía appointed architects Costa-Fierros to come up with a masterplan for redevelopment of the whole area. 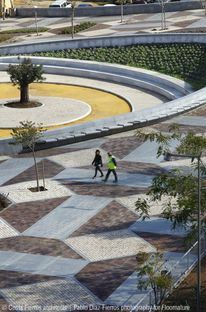 With its ceramic, limestone and granite pavement, the new Music Park becomes a big plaza linking two residential neighbourhoods. 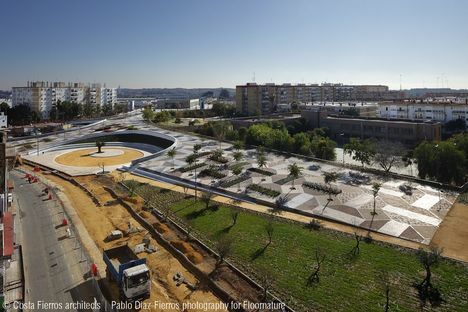 The extension of Seville's underground line 1 completed in 2009 with construction of the above-ground station of Cocheras offered the Agencia de Obra Pública de la Junta de Andalucía an opportunity for redevelopment of the area above the station. 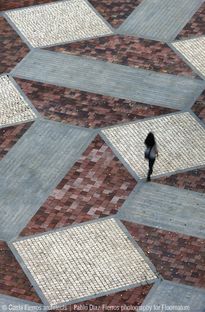 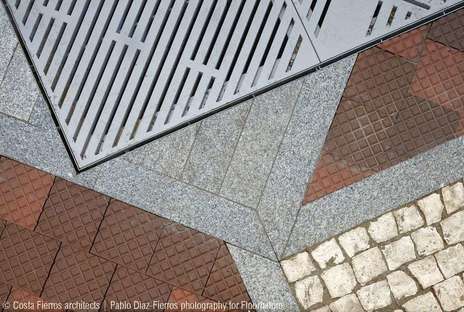 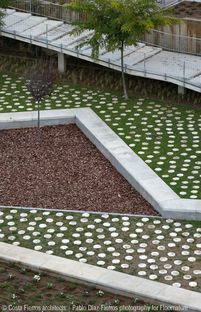 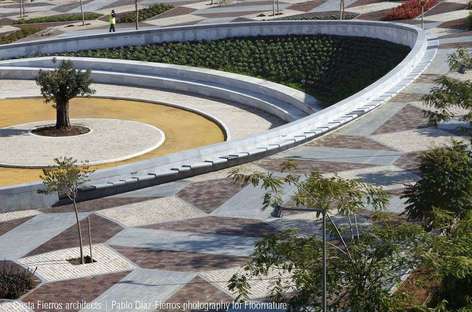 Architects Sara Tavares Costa and Pablo F. Díaz-Fierros came up with a plan for a great “urban pavement” in which different materials are used to decorate the city, making the neighbourhood easy to recognise even from a distance. 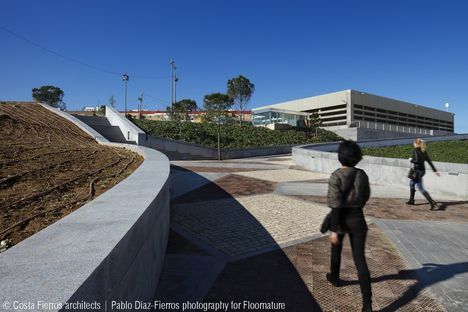 Costa-Fierros? 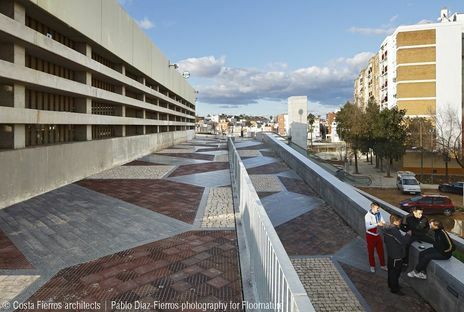 project is significant for use of pavement as a landmark, a horizontal urban sign among the many vertical signs distinguishing our cities, the purpose of which is not only orientation but improvement of the quality of public living and the sense of belonging to a place. 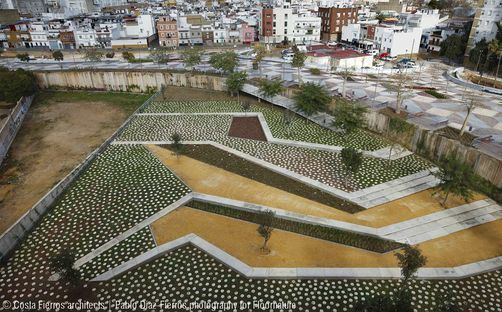 The site of what has been nicknamed Barrio della Musica Park stands between Barrio de la Música itself and Barrio de Nuestra Señora del Águila, a degraded area without any particular facilities, locally known as a no man?s land, a place of solitude and desolation. 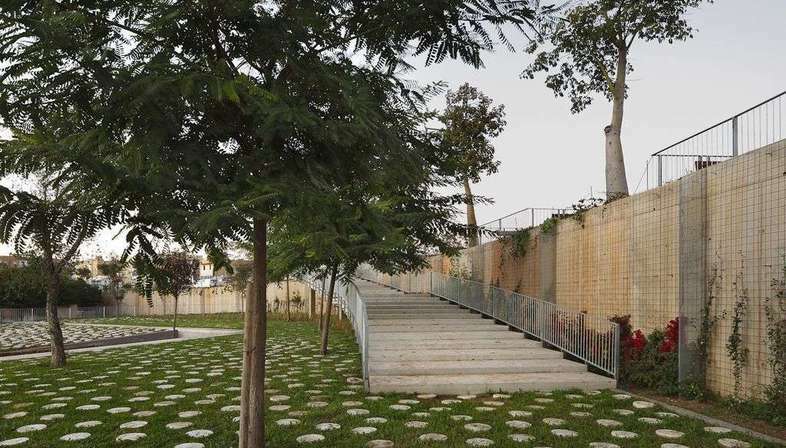 Following construction of the underground station in 2009, a cement tunnel was built under a site measuring more than 32,000 metres square which was once used by the city?s horse carriage owners, erecting a 7 metre high physical barrier between the two urban neighbourhoods. 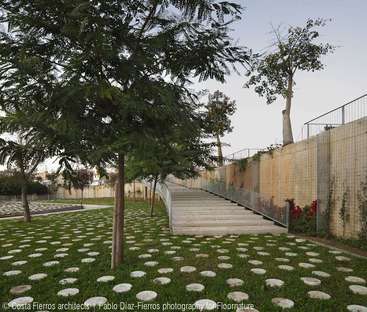 Costa-Ferrios? 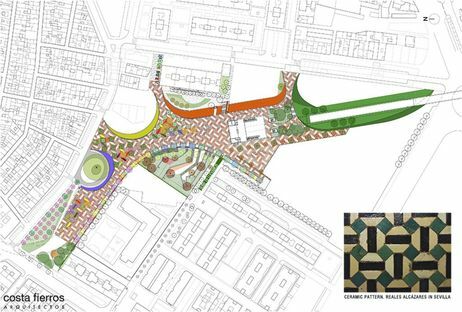 masterplan for the area aimed to reconnect them by creating a shared urban space which would also improve the station?s accessibility. 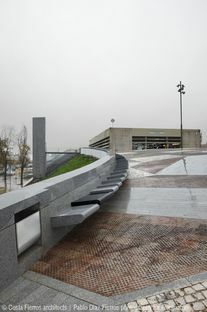 The architects designed a long arch-shaped walkway from the southern side to the northern side of the site, rising gently to the station at an angle which improves appreciation of the surrounding urban landscape. 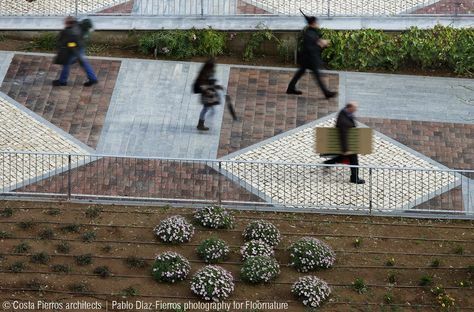 The distance from which it is seen while walking along the promenade lends dramatic unity to a sequence of anonymous façades. 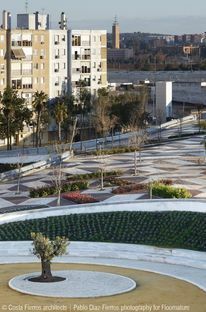 The space that opens up as we walk up to station level becomes a big plaza with a strong impact reinforced by the design of the pavement, inspired by that of the Patio de Muñecas dal Reales Alcazares, an admirable example of Modejar architecture in Seville made of limestone, granite and ceramic and enriched by flowerbeds planted with trees and shrubs. 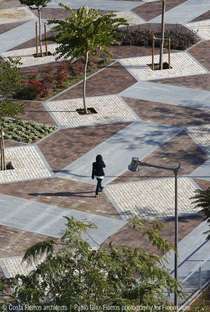 This urban carpet defines the confines of the area and creates links within it, with trees and pathways indicating points of access to the adjacent neighbourhoods. 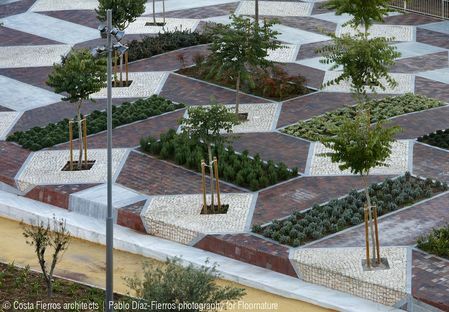 Twenty-four different plant species, including local species chosen on the basis of position, colour and fragrance, are distributed in a way which does not block the view of the whole plaza from any point on the site, ensuring that people experience the sense of control and confidence in the place that is so often lacking in outdoor spaces. 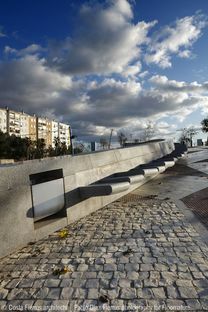 Builder: Rafael Morales S.A., Heliopol, S.A.U.